Bought this to replace a dispenser from Home Depot. This one looks good and is good quality. 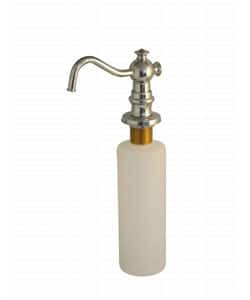 We are in the process of doing a complete kitchen remodel and this soap dispenser looks perfect with the Giagni Bridge kitchen faucet. I am not sure if they are the same manufacturer but they have the same finish and coordinating details. Highly recommend!!! This is a good looking dispenser, and it would be a good value, but... The specifications in the listing say it will work on up to a 1.5 inch deck. The mountable depth for this dispenser is not even close to 1.5 inches. It comes up well short of spanning our granite countertops. I am a long-time DIYer, so I extended the mounting hardware with an adapter, but that took extra time and added cost, thus reducing the value of this purchase, plus a lot of customers wil not go to that trouble. This dispenser is exactly as advertised. Heavy brass construction with large volume canister. Compliments my sink and chrome faucet beautifully! Looks good & works well. This is my second soap dispenser. The first one was a different brand from a different seller and it never worked right so we stopped using it and hesitated to get another. So far I am quite pleased with this one's price, quality, looks and function. Doesn't fit a standard 3cm countertop! 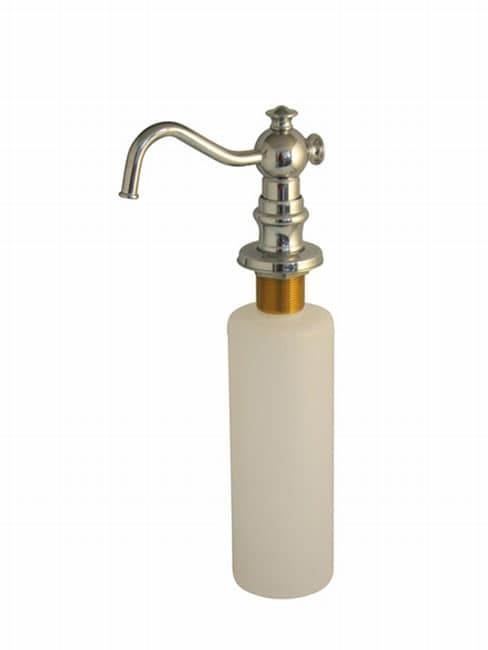 The threaded portion of the soap dispenser is not long enough to fit a standard countertop depth. The color and shape matches the faucet very well.If you like the country look this is great. excellent price and quality. i would recommend this for all projects. we purchased it for a granite counter top and it was too short. we have it in storage currently, hopefully will use it someday. It's nice and heavy, very good quality! Looks good. Does not pump that well. "Is this polished chrome or unpolished?" Hello bgun, this item is polished. Have a great day! "We're looking for a soap dispenser to match our chrome faucet. Does this dispenser look more like chrome or brass? I would think chrome (b/c that's how it's plated) but the picture makes it look more like brass." Hello bgun, this dispenser has a chrome finish look to it. Please let us know if you have additional questions. Thanks for shopping with us! "Does this dispenser fill from the counter top or from under the counter?" The dispenser is placed under the counter. "How thick of deck does this dispenser fit?" Fits decks up to 1-1/2" thick.